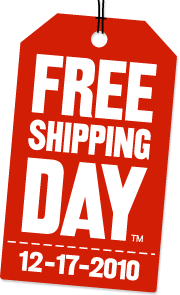 Happy National Free Shipping Day! Call your order in today @ 1-866-258-1554 and mention the code “FreeShip101” and receive FREE FedEx Ground shipping! Order must be placed over the phone. Offer good for today (12/17/10) only. Free shipping to Continental US states only. Offer good only on products listed on installerstore.com. Call with your order today! !